This month the blog turns one. To celebrate they are doing lots of fun stuff all month long! The challenge for this week was to create a birthday invitation using any Cuttlebug folder. Since my daughter's birthday is coming up in just two months, I decided to get an early start and enter the challenge. For a long time now she's been telling me she wants a "Baby Birthday." Anyone who knows her, knows she LOVES babies --both the real ones and dolls! Must admit it posed a challenge for me to come up with something that is babyish, but isn't too baby shower-ish. All of it had to pass her inspection, and she was pretty picky about what she wanted and didn't want. I managed to find something to satisfy her and even found a Baby Doll cake - thanks to Better Homes and Gardens! Oh! how cute!! Hope you join us every week this month - want to see everything you do on this theme!! Thanks so much for joining us in our Cuttlebug Challenge Birthday Palooza!! I wanted to do a rag doll theme (Raggedy Ann or something), but M. wouldn't hear of it. She likes real looking babies and wanted a real looking baby invite and cake. WOW, waht a different theme for a party, your daughter must be a special and unique girl....two things I love in a girl! I certainly hope you paln to play along all month I cant wait to see all the projects you make for this party! This is fantastic! I am so glad you were able to join in the fun at The Cuttlebug Challenge Blog. I hope you can play along all month long..I look forward to the rest of your party creations. Awesome card! I love the touch of green in there, and that is so beautiful! Thanks for playing along! what an excellent theme -- it's going to be so fun! your invite is lovely!! thanks for joining in the fun at cuttlebugchallenge! WOW! This is just too much! I adore it. Wow...what a gorgeous invite. You did a great job at this week's challenge. Thanks for playing along with us at Cuttlebug Challenge Blog. Oh I am so in love with this invitation and that sweet image it is gorgeous Esther I also love babies what a fun birthday theme. esther! this is fantastic! (love your use of the baby clip art...and ty fo the link...) TFS! 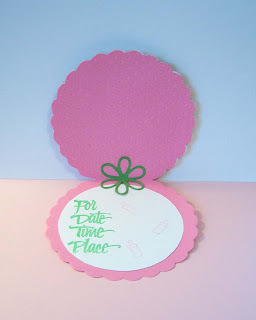 and Thanks for playing along this week at the cuttlebug challenge blog! cuuuute! thanks for playing along! super fabulous, love your take on your theme! Thank you for joining our challenge. I love your invitation.